Why Ethiopia and Kenya want the substitute of Somalia's Flag? viewed as interference in the sovereign affairs of Somalia. On Tuesday's African Union session, Ethiopia announced that it had discussed with the President Hassan Sheikh Mohamoud about the reproducing of the Somalia's flag and he had accepted with the condition of taking the case to the African Union. 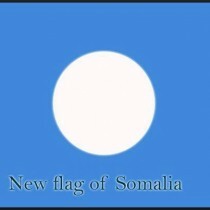 Kenya demanded to be substituted the five-pointed white star to moon-shaped white figure, the case is new and deeply angered the Somali people because the national flag is a sensitive issue in Somalia. The five-pointed white star in the center represents the unity of all Somali ethnic group found in Djibouti, the Ogaden region in Ethiopia, the North Eastern Province of Kenya, and the former British Somaliland and Italian Somaliand territories in present -day Somalia. Other issues that Ethiopia discussed with President Mohamoud are to stop rebuilding Somalia's National Army and to withdraw all the defense pact-treaties that Somalia have recently signed with Turkey, Qatar and United Arab Emirates.